This native of Mexico is an unbeatable choice for trellised pots on the patio, producing scads of pouty lipped purple trumpets (1-1.5" flowers) on wiry stems all season long. Light green foliage that looks delicate but is robust and carefree adds to the overall wow facto of this great plant. Hummers will seek this one out! A member of the snapdragon family, also known as chickabiddy, asarina is native to Mexico, where it reaches great heights. A choice selection for pots and window boxes, for the lovely fresh-green leaves and tendrils will climb or spill over, displaying masses of flowers. Flowers best in late summer and fall, just when we want a fresh look in our garden. This unique flower will captivate you with the fragrance of lilies and hyacinths and an artistic form reminiscent of a nautilus shell. A heat-loving tropical vine that blooms late summer to fall. 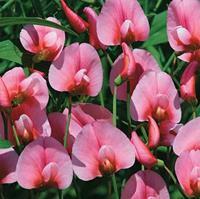 Keep overwinter up North dormant for more blooms the following year. Also known as Snail Vine. The inspiration, to Keats: “Here are sweet peas, on tip-toe for a flight: with wings of gentle flush o’er delicate white, and taper fingers catching at all things, to bind them all about with tiny rings.” Introduced in 1737. Old-fashioned blooms of ivory with a blush of pink are exquisitely scented and bloom early and reliably. 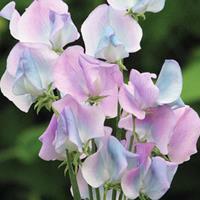 "On gossamer wings" comes to mind at first flower of this remarkable new variety. Delicate pink flowers transform to turquoise during their time under the sun. Sweetly fragrant and magical! Image courtesy Thompson & Morgan.